Its A Wonderful Life DVD from DVDLand. 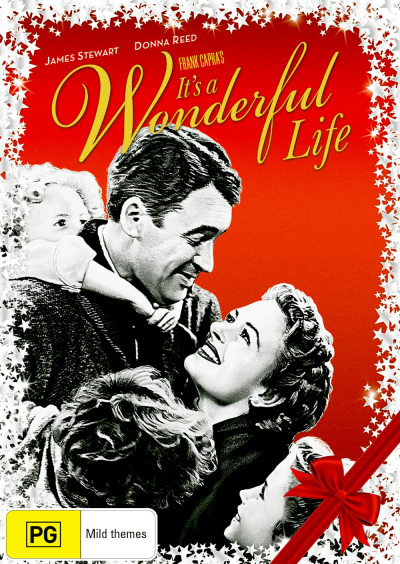 In this heartwarming tale, James Stewart plays George Bailey, a small-town young man with dreams and ambitions that are never realised because of his ever present responsibilities of work and family. While he is at the brink of despair and contemplating suicide, his guardian angel Clarence (Henry Travers) appears and takes him on a journey to show him what life in Bedford Falls would have been like without him. George Bailey has so many problems he is thinking about ending it all and it is Christmas! As the angels discuss George, we see his life in flashback. As George is about to jump from a bridge, he ends up rescuing his guardian angel, Clarence. Clarence then shows George what his town would have looked like it if had not been for his good deeds over the years. Will Clarence be able to convince George to return to his family and forget about suicide? With the endearing message that no one is a failure who has friends, Frank Capra's heart-warming masterpiece continues to endure, and after over 60 years this beloved classic still remains as powerful and moving as the day it was made. This timeless movie, with its timeless message, is the greatest year-round gift of all! It's A Wonderful Life DVD. Click the button below to add the IT'S A WONDERFUL LIFE to your wish list.